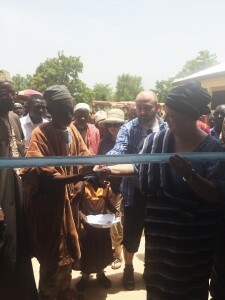 Lucas Martin (Ipsos Foundation) and Gail Black (CFTC) cut the ribbon with the Chief of Kpachelo, officially opening Kpachelo school on May 10th 2016. TORONTO, May 25, 2016—Thanks to the generosity of one of Canadian Feed The Children’s (CFTC) leadership funding partners, Ipsos Foundation, a new primary school has been built for the community of Kpachelo in the Savelugu-Nanton Municipality in Northern Region. The school will improve students’ enrollment, retention and the quality of education. Hundreds of people came to the grand opening ceremony on May 10, 2016 including parents, teachers, community members, local media, and dignitaries from the region. It was a joyous celebration featuring traditional dancers, live music, and poetry readings from students. Eighteen months ago, education interventions, activities and achievements realized over the last few years risked being compromised or reversed because students had to vacate their school due to structural damage caused by a fault line. Children were sitting under trees for classes where they were exposed to harsh weather conditions including heavy rains and dry desert winds which ultimately led to significant absenteeism. 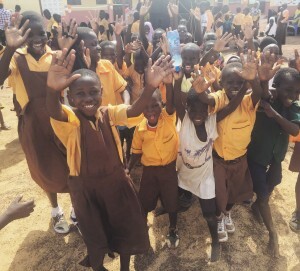 Students celebrate their new school at the grand opening in Kpachelo, northern Ghana. The construction of this six-unit classroom block with latrines was overseen in partnership with Regional Advisory Information and Network Systems (RAINS), one of CFTC’s longstanding partners in the Northern Region of Ghana. This new build will ensure access to adequate school facilities at the kindergarten and primary levels, benefiting 248 children directly as well as thousands more in years to come. Hardi Tijani, Executive Director of RAINS, said the construction of the primary school was also intended to sustain gains that were made in the community since 2008 through education and livelihood empowerment programs including the sponsorship of 131 child ambassadors. CFTC’s goal is to ensure that children, especially girls, can attend, remain in and graduate from school so communities are empowered to break the cycle of poverty that is so prevalent in northern Ghana. Thanks to our loyal supporters, this project is an example of the tremendous impact we can have on children’s lives when we work together.